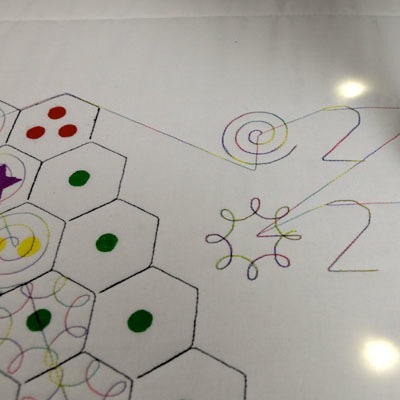 Threadsteading is a two-player territorial control game for quilting and embroidery machines. The game is played entirely on the machine, with input via a custom-mounted controller and output as a tangible, sewn artifact. Gameplay is turn-based and designed around the unique constraints of the platform and craft. Because quilting requires unbroken paths of thread, each turn must pick up where the previous turn left off. The rules encourage players to have an even spread of lines across the surface, since ideally a quilt has neither large unsewn portions nor multiple stitched lines on top of each other. Albaugh, L., Grow, A., Liu, C., McCann, J., Mankoff, J., and Smith, G. Threadsteading: Playful interaction for textile fabrication devices. Proc. of the 2016 CHI Conference Extended Abstracts on Human Factors in Computing Systems. ACM, New York, 2016, 285–288.